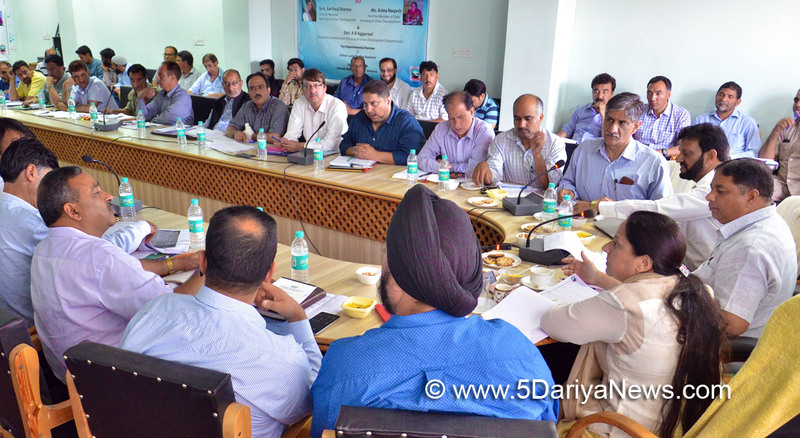 Minister for Housing and Urban Development, Sat Paul Sharma today stressed on effective implementation of Swachh Baharat Mission (U) and prioritizing the works under the programme so as to achieve targeted results in given time frame besides focusing on utilization of funds under SBM in the area of Solid Waste Management. He said that Waste Management is challenge for everyone and some innovative steps needs to be taken in this regard.The Minister said this while addressing the officers of Urban Local Bodies, Kashmir Division in a meeting convened to review its functioning and performance made for the overall development cities and towns.Minister of State for Housing & Urban Development, Asiea Naqash was also present in the meeting.Financial Commissioner HUDD K B Agarwal, Director Urban Local Bodies Kashmir Tufail Matoo, Managing Director JK Housing Board Dr. Manmohan Singh, Joint Director Planning HUDD, Chief Executive Officers and Executive Officers of Municipal Councils/Committees, Executive Engineers and other concerned officers attended the meeting.During the meeting, Director Urban Local Bodies Kashmir gave the detailed presentation on physical and financial achievements register under SBM (U), revenue generation by MCs form its assets, status of declaration of MCs ODF, progress of works taken up under AMRUT, drainage works, and other important activities which are being carried out by Local Urban Bodies in the division. Discussing the performance under SBM (U), the Minister exhorted upon the CEOs/EOs to put in serious effort in meeting the targets by effective utilization of funds under the programme.“GoI is has been allocating huge amount of funds for the implementation of the programme in the state and should be our sole responsibility to utilize the money in a transparent and effective manner”, the Minister said adding that the funds should not get lapsed because of our inabilities.The Minister briefly discussed the status of construction of IHHLs/Community Latrines, Committee wise and directed for declaring all the MCs ODF by July 2018. On the occasion, the Minister also felicitated the EO MC Tangmarg for declaration of said MC ODF.Regarding efforts of ULB Kashmir division to deal with Solid Waste Management, the Minister asked for practicing some innovative ideas for proper waste management. He asked the CEOs/EOs to make this an employment generation area for unemployed youth and to earn a good profit out of it.The meeting also discussed the status of financial position of MCs with details of revenue they have generated from its various resources/assets. The Minister interacted with CEOs/EOs and enquired about the reasons of increase and decrease of revenue wherever reported.While disusing the revenue generated from collection of building permission fee, the Minister asked the Director to look into the possibilities of rationalizing the fee structure.It was informed that a Committee under the Chairmanship of Director ULB is to be constituted which will recommend the revision of building permission fee. The meeting also discussed status of BADP works, installation of LED lights, drainage and other works.The meeting was apprised about the status of projects taken up in various MCs including construction of Shopping Complexes, Community Halls and development of Bus Addas. The Minister asked the officers to take the peoples representatives in confidence while taking up the works in their area.With regard to preparation of MCs falling under Shri Amarnath Yatra route, the Minister asked the officers to ensure that the devotees get all requisite facilities besides maintaining cleanliness in the areas. He also asked to make hoardings to aware people regarding Swachh Bharat Mission and their role in ensuring its effective implementation.Speaking on the occasion, Minister of State HUDD Asiea Naqash said that the mandate given to the department is to work for the development of urban areas including cities and towns and we should be able to give our best in achieving the set goals. She also stressed on expediting SBM works with special attention to solid waste management programme.She asked for close monitoring and proper supervision of works for their better results. All the MCs need to perform in such a manner so that it actually reflects the development of that particular area, she added.Asiea directed the officers to make these bodies self-dependent by generating handsome amount as revenue from its assets. He also asked for creating of assets wherever land is available with them.